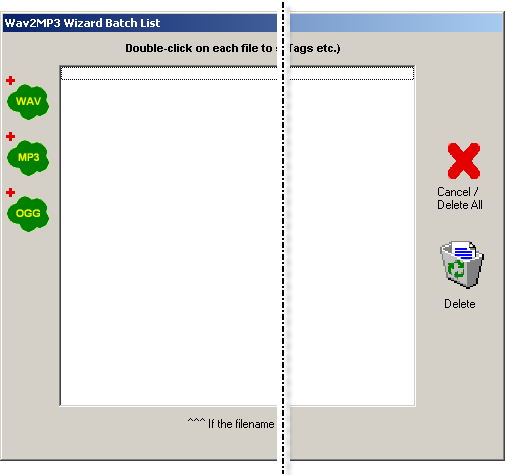 On this page you find information about converting Wav to MP3 with Wav2MP3 Wizard version 3.1. With this program you can convert many Wav files to MP3. You have to take the ID3Tag info into account, this has to be filled in by yourself. In spite of the partially automated process, it can be quit a job to fill it in to your likings. If this (ID3Tags) is of non importance to you, converting will be done in minutes. 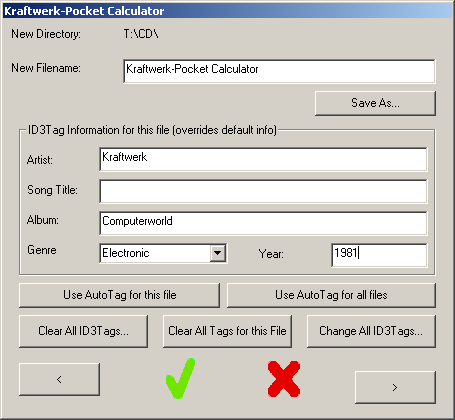 Another way to get your ID3Tags completed is by burning WAV files on to an audio CD If you convert (rip) your audio CD to MP3 and you are connected to the internet, the ID3Tags will be completed automatically. First let’s take a look at the settings. 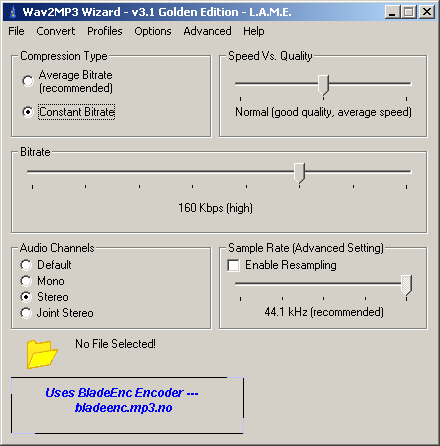 The main window of Wav2MP3 Wizard looks like the picture above. Go to the menu Profiles and select CD Quality. Change the settings according the picture above. Most MP3 players can handle this. If you want better quality, read the manual of the MP3 player first. If you have changed the settings to your likings you can save it to a profile. Click the Options menu and select the tab myProfile. Click the button ‘Save myProfile’, see below. Then click on the green checkmark. 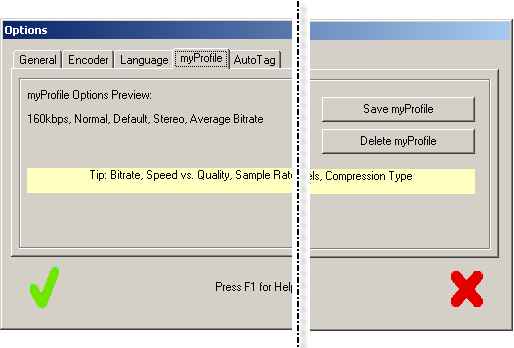 Every time you start Wav2MP3, this profile will be loaded so you don’t have to adjust the settings in the main window. To convert your WAV files you first have to select them, then you can modify the data, see after this. Go to the menu File, Browse… Ctrl+O, whereupon the window below opens. Click on the green cloud with the text WAV, select the files you want to convert and click on Open. Double click on a file to see its properties, like the save location of the converted file. Modify the data. You can use the button ‘Use Auto Tag for all files’ but this will probably not give the expected result. Use the ‘<’ and ‘>’ button to navigate through the list of files as you alter the data. 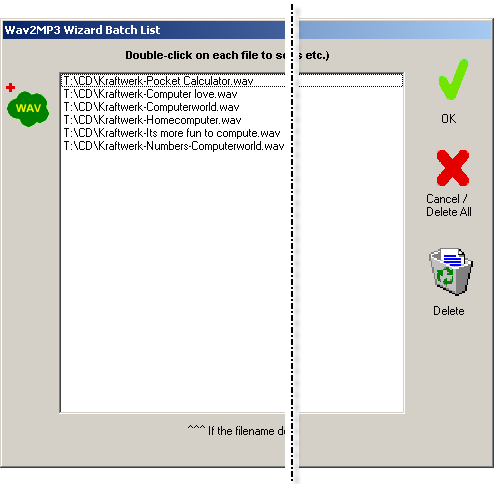 If everything is altered to your needs you can click the green checkmark and you will be back at the Wav2MP3 Wizard Batch List window, clicking the green checkmark here will lead you to the main window of Wav2MP3. To actually convert the files go to the menu Convert, Encode Ctrl+E whereupon a DOS box opens. Copy your MP3 files on to your MP3 player and you can listen to your favourite vinyl everywhere! Back to top of 'Wav to MP3 with Wav2MP3 Wizard'.